Bobby Kendall earned a Bachelors Degree from Skidmore College. 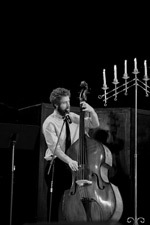 There, he studied bass with Rich Syracuse, while working closely with faculty members, Mark Vinci and Chris Brubeck. While earning a Masters Degree in Jazz Studies at the SUNY Purchase Jazz Conservatory, he studied bass with Todd Coolman and Doug Weiss. He also worked closely with the vast array of jazz faculty at Purchase, including Jon Faddis, Ralph Lalama, Charles Blenzig and Hal Galper. Bobby has had the amazing opportunity of sharing the stage with jazz musicians like Jimmy Cobb, Louis Hayes, Ralph Lalama, Mark Vinci, Joshua Redman, Mark Taylor, Pete Zimmer, Spike Wilner, Cyrille-Amiee and Dylan Cantebury. He has also performed at the Django Reinhardt Festival in Samois,France. While there, he played and recorded with great gypsy jazz guitarists like Sebastien Giniaux, Adrien Moingard and Mathieu Chatelain. Bobby currently resides in Troy, New York.